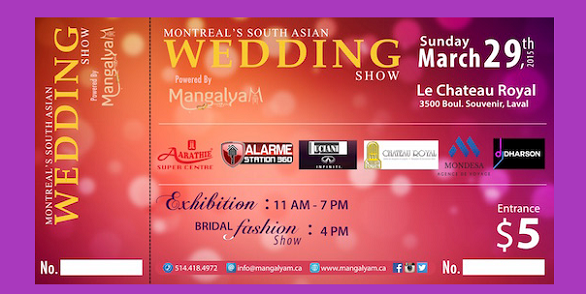 Everything you need under one roof at the Montreal South Asian Wedding Show! As you may know the birth of Mangalyam Magazine in 2012 came from an unaddressed need for a consolidated wedding resource within the South Asian community in Montreal. Mangalyam intended to provide a platform for local Montreal vendors to showcase their products and services and to act as a resource for wedding planning tips and trends. Mangalyam also served as a medium to share the special stories of young couples, from the very beginning to the hectic and stressful days leading up to their momentous days. Our 1st, 2nd & 3rd annual issues were a great success and we look forward to releasing our 4th issue at the Mangalyum Bridal Show!